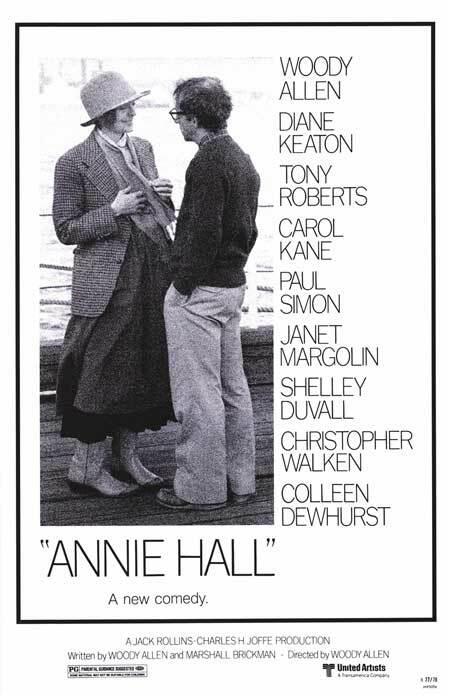 Alvy Singer neurotically ruminates on his neurotic relationship of several years with Annie Hall. The stream of consciousness narrative jumps around in time, including some of his previous marriages, but mostly he focuses on Annie and their troubled love. When it’s working, it’s great, but when it’s not, it’s conflict between her free-spirited nature and his fear of new things. The way they rub off on each other affects their feelings for each other, and over the years, they drift in and out of love through a haze of existential discussion of sexuality and life. This is a very philosophical film. More than what I’ve seen from Woody Allen before, this is specifically about his themes of sexuality and mortality. Both Alvy’s and to a lesser extent Annie’s personal issues are informed by Woody Allen’s outlook on life. Frequently the story will stop for a moment for Alvy to philosophize without much relevance to the plot. At this point, it’s hard to tell if Allen himself recycles his jokes or if most of the jokes of the movie were strip-mined by quoters and presented without context. It’s probably the latter, although with his strong themes, the jokes start to run together anyway. I appreciated the occasional turns toward the surreal by playing with narrating to the fourth wall and walking into flashbacks. In one scene early on, Alvy steps out of the scene to complain about an annoying bystander, and the bystander responds, to be rebuffed with the perfect counterargument in the way things “should have” happened, which is probably a familiar sentiment to pretty much everybody. Alvy has a friend who’s in a few scenes in the movie that I mainly cared about because he calls Alvy “Max” just because “Max is a good name for you”. He said that in an extremely long shot that could have been dubbed into anything, so the name thing may be an artifact from the original plot. I don’t know why Alvy hangs out with the guy, or why he puts up with listening to Alvy’s rants about anti-Semitism, but I do understand Alvy and Annie’s relationship, kind of. They’re attracted to the differences in each other, but the differences are also what drive them apart. Ultimately, the conflict is a pragmatic one. You want them to be happy together, but it’s clear that together and happy are mutually exclusive. This was a strange, hard to follow film with more philosophizing than joking. The way it jumps around makes a slight barrier to the pathos because it’s hard to tell what point in their lives the current scene is in, and sometimes what relevance this scene has to the story. It was fun and thought-provoking, but might have been better as a book than a film. Watch this movie: with a pen and notebook. Don’t watch this movie: to learn how to structure a story.